After losing ALL FOUR cars to some sort of power-related gremlins at Long Beach, many Indycar fans lamented at the bad week Andretti Autosport was having. Well friends, lament no further! On May 28 2017, McLaren will enter a single car in the 101st Indianapolis 500, powered by Honda. The car will be run by the Andretti Autosport team, headed by founder, owner and Chief Executive Officer Michael Andretti, a former IndyCar champion who raced in Formula 1 for McLaren alongside the legendary Ayrton Senna for a single season (1993) and is the son of three-time IndyCar champion and one-time Formula 1 champion Mario Andretti. The McLaren-Honda-Andretti entry, a Dallara DW12 chassis as used by all Verizon IndyCar Series teams, will be driven by current McLaren-Honda Formula 1 driver Fernando Alonso, who has started 275 Grands Prix, has won 32 of those races, has become Formula 1 world champion twice, and has been Formula 1 runner-up three times. If you looked at your calendar this morning, thinking April Fools Day came a bit late, you’re not alone. And yet this is no joke. Alonso, who is sixth on the all-time win list in F1, is actually going to race at Indy this year. Well, if he qualifies, since at the rate entries are being announced this might be one of those wonderfully heartbreaking years where we have actual bumping on bump day. Who am I kidding: Alonso is arguably the greatest driver of the current era. He’s GOING to qualify. Alonso’s move from F1 to Indycar, albeit for one race, isn’t entirely without precedence recently. It was only five years ago that Tony Kanaan convinced his longtime friend Rubens Barichello to cut short his waning F1 career to spend a season as KV Racing teammates. That year at Indy, Barichello led two laps and finished 11th, which means. . .Alonso should do fine. “More than 30 years [after McLaren’s Indy 500 wins], I’m pleased and proud that we’re about to embark on a new IndyCar era for McLaren, this time with Andretti Autosport and Honda. There are plenty of “possible” qualifiers in that quote, and yet not enough to prevent McLaren fanboys and fangirls from wetting themselves with excitement. And who can blame them? 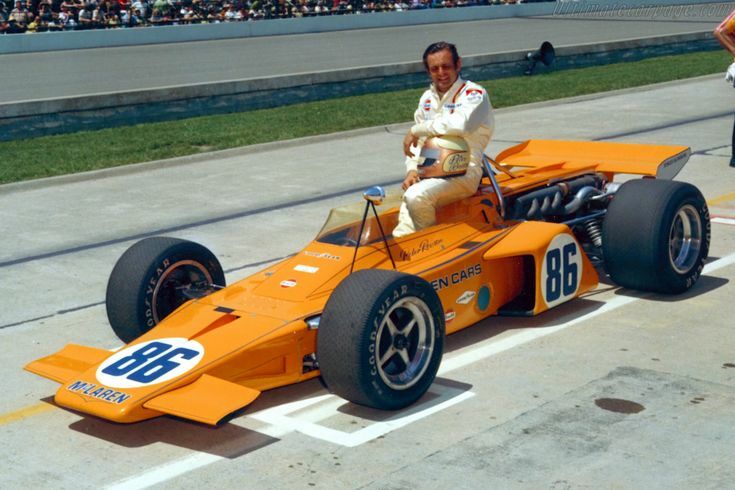 After all, McLaren did win the Indy 500 three times in the 1970s, with some glorious looking cars to boot. Seriously, just look at Peter Revson’s 1971 entry, or Mark Donohue’s winning 1972 car. Those are as iconic as Indycars get. Final Lap: It was also announced this weekend that two-time Indy Lights runner-up Jack Harvey would also be piloting an Indy 500 entry for Andretti and Michael Shank Racing, bringing the total Andretti-related entries to six. Despite his driving skills, Harvey might be best known among racing fans as “the guy that sounds like Nigel Mansell”. You know, former Formula One champion Nigel Mansell, who also late in his career became and Indycar driver. In fact, he was the teammate of Michael’s father, Mario Andretti. It’s a small world after all. UPDATE: And here’s Alonso discussing the news, apparently after being cornered in a hotel hallway. This entry was posted in Indycar and tagged Andretti Autosport, Fernando Alonso, Indianapolis 500, Jack Harvey, McLaren. Bookmark the permalink.